The best chocolate wholewheat waffles, ever! Truly over the moon. 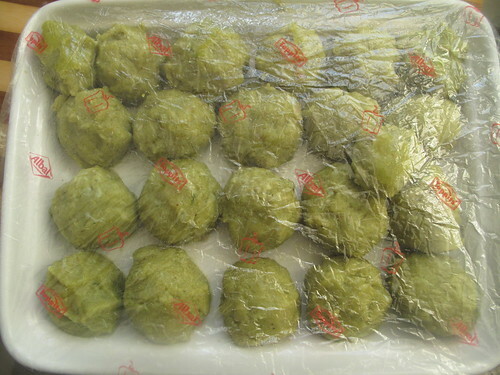 At lunchtime today, I’ll be on a sushi-making course !!!!!!!!!!!!!!!!!!!!!!!!!!!!!!!! I’m excited. 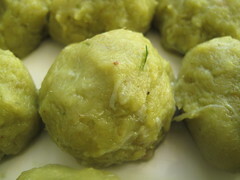 And it’s all thanks to P – the protagonist in a recent scottish tale of mine: on Haggis! Believe me, he has redeemed his image in my eyes. Forever. See his wife, C and her friend were going to take the course together but the friend couldn’t make it – out of town…..and guess who gets to go??????????? Of course I’ll take many photos, of course I’ll attempt to make a video and of course we will definitely have to try this on KB. But till then, will this suffice till I return? 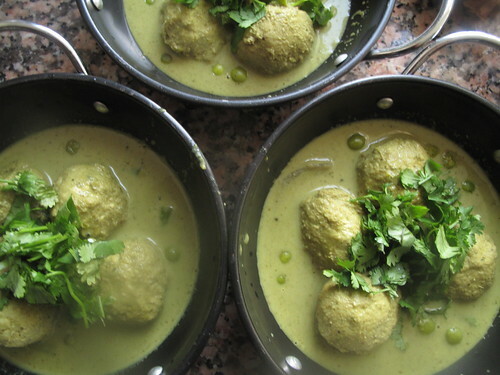 Fish balls in green curry: delicious, tender balls of white fish, rolled and simmered in velvety coconut sauce, elevated to the greatest heights of sensory delights by some Thai green curry paste? 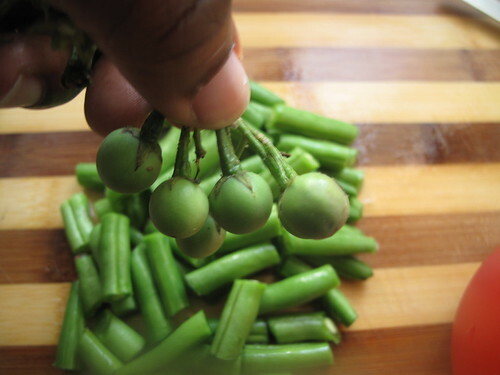 Did I mention the sweetness the green beans take on (I love green beans the most in Thai green curries) or the crunch and slight bitterness of the pea eggplants? Well, if you must know all the details…then read on and I hope it delights you as much as it did M, my husband and I! PS: I’ve seen people garnish their green curries with red chillies…more for the colour contrast and not for additional heat! 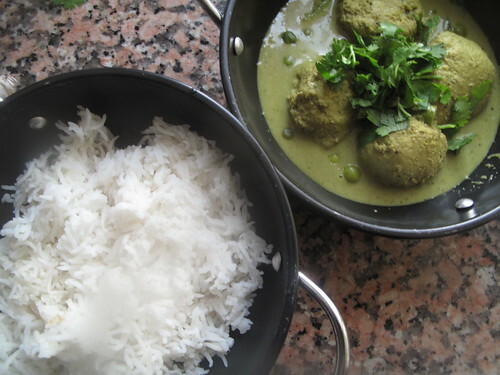 A bit like my Saag chicken photo. 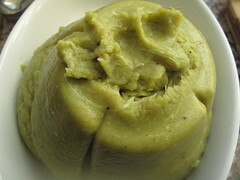 In a pan or in your rice cooker. 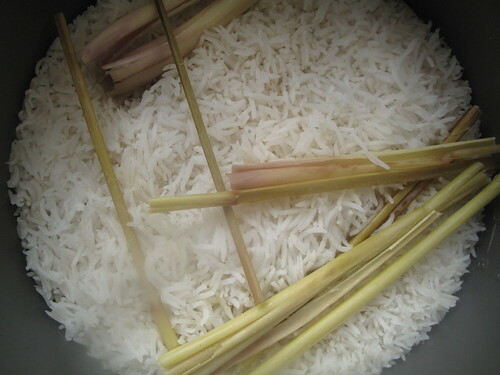 Bash up a stalk of lemon grass with a rolling pin and cut it into 2/3 pieces, add salt and water to your rice and let it cook! 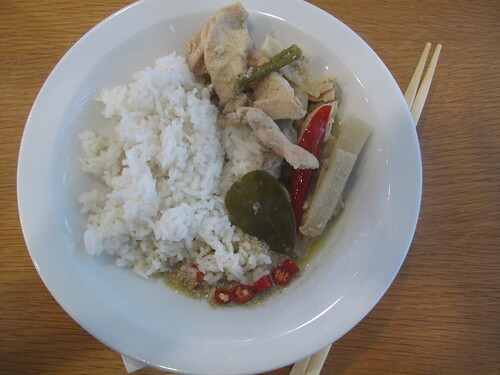 This is my alternative to Thai fragrant rice! 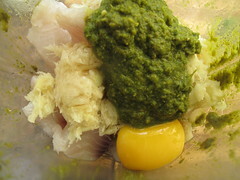 Put blended fish mixture in a bowl and using a tablespoon to measure, roll into balls and set on a tray/plate. Cover and chill for half an hour. This is to firm up the balls and ensure they hold well together so they don’ disintegrate the minute they go into the simmering stock. And just in case you’re wondering about the shower cap over the food. Don’t. ‘Cause it’s a food cap not a shower cap! 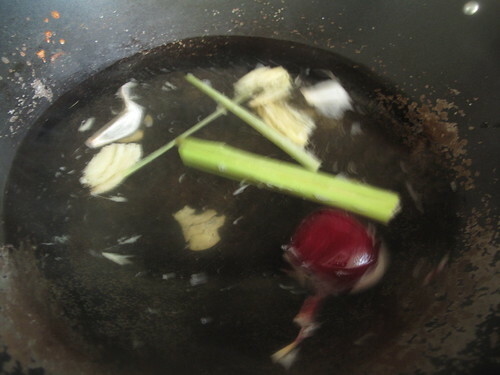 After the half hour’s gone past, heat up a large pan/wok and pour in the stock. 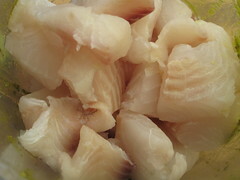 Bring it to the boil and then add the fish balls. Simmer for 5 minutes until cooked through, stirring very gently occassionally. 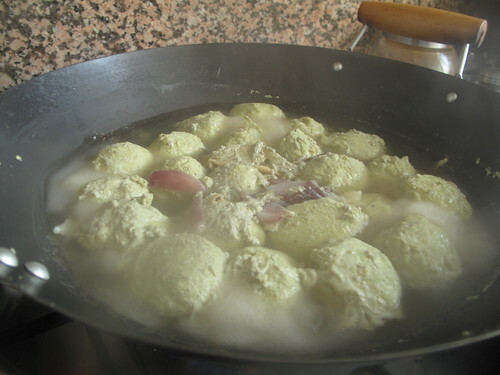 Remove the fish balls from the stock and discard the stock. 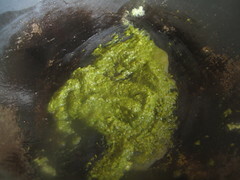 In a large pan/wok, out in the remaining curry paste and cook till fragrant. 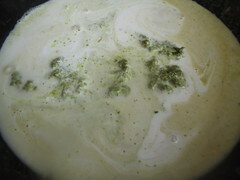 Add the coconut milk and cook till it boils then add fish balls and heat through. Add the eggplants and chopped green beans and let cook for 5 minutes then add the rest of the lime juice and coriander. Enjoy. 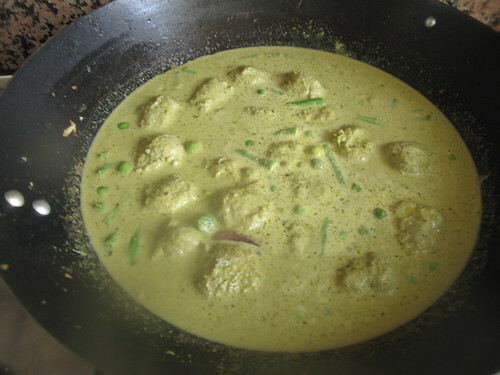 If you think the sauce is too thin (which is typically how Thai curries are), make a paste of 1-2 teaspoons of cornflour (cornstarch) and water, add to the mix and let cook through. I hope you’re looking forward to my sushi-making antics as much as I am…coming soon!